I recently had the opportunity to get to know self-published author, S. L. Pierce. Check out what she had to say and enter the giveaway to win a copy of her newest release: Secrets. My name is S.L. Pierce and I spent ten years earning a PhD in engineering before figuring out I didn't really want to be an engineer. I kept talking about J.A. Konrath and his self publishing endeavors to my husband and he said, 'you should write a book'. I laughed it off at first, but couldn't get the idea out of my head. So that's how it all began two years ago. I write what I like to read. My genre is mystery/thriller and my style is quick, I guess you would say. When I read, I tend to skim a lot of the descriptive stuff, detailed scenery, clothing, etc. So my writing skips a lot of that detail. I do really focus on an excellent plot and good character development, though. I chose self publishing for two reasons. One, because of my writing style my books tend to be around 40,000 words instead of 60,000+. I didn't feel any publisher would work with that. I have tried adding material to make the story longer, but it feels very forced and messes up the story. Two, I really loved the idea of the freedom. I can write what I want and like Konrath says, I can finish my book on Thursday and have it for sale by Saturday. I was intimidated by self publishing when I began. Trying to edit out every punctuation and grammar error on something you've read a dozen times is challenging, to say the least. But now I really love it. It's a lot of work, doing the publicity myself, but it's also very rewarding. I've connected with a lot of supportive and encouraging people. The authors who influenced me the most, as far as starting writing and self publishing are Stephenie Meyer and J.A. Konrath. Stephenie Meyer because, no matter what you think of her writing, here is a woman who had never written anything, and she gets up one day and says 'I have a story to tell' and then just does it. J.A. Konrath because he showed if you are professional and take it seriously (write a great book, have a professional looking cover, stellar editing, etc) you can make money as a writer. The freedom is incredible. My latest book is called Secrets. It is about a woman named Gwen Michaels, who has a secret past. When a man attempts to kill her, she assumes it is because of this past. But what she finds out is it has nothing to do with her past. So she has to find out the who and why. Secrets has a little murder, a little spying, a little industrial espionage, and just a touch of revenge. A key feature of my stories is a very strong female lead. I get really tired of books where the female lead is really strong and smart but ends up captured by the bad guy. So my characters don't allow that to happen. My books are available at Amazon, Smashwords, and Barnes and Noble, all for 0.99. You can find me at facebook, twitter (@piercebooks), piercebooks.com, and slpierce.blogspot.com. My blog is mainly fun thoughts about writing topics. I also tweet a movie quote each day (try anyway) and put the answer on my blog. These are from memory, not a website, so feel free to add a comment if I get it wrong. 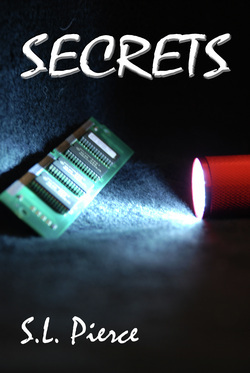 S. L. Pierce has kindly offered an ebook copy of Secrets to one lucky winner. Rules: To go into the draw you need to be following my blog and leave a comment below (don't forget to include an email address so that we can contact you should you win!). Sounds intriguing - so count me in :-) ! Secrets sounds very interesting. I'd love to be in with a shot at winning! I love that your female lead doesn't allow herself to get captured by the bad guy. It's the one thing that really ticks me off about some of the books I read. I'll be adding it to my TBR list!